Café Hamee Ast’o at Saket in Delhi. 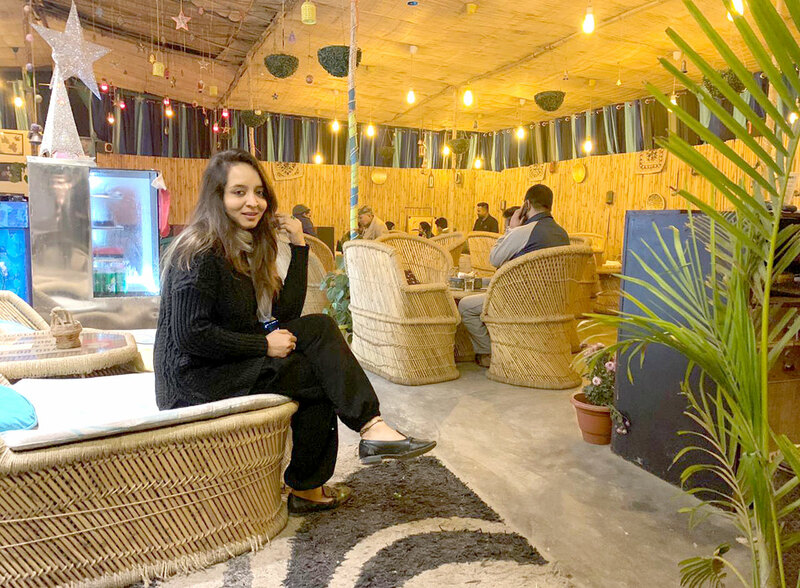 A young Srinagar woman established the first Kashmiri art café in Delhi that promotes authentic Kashmir food and art. This is said to be the first of its kind in Delhi that seems more of a Kashmiri cultural space than an eatery. It is decorated with symbols of Kashmiri art and cultures like Kangris, Tumbaknaris, carved copperware, items of papier-mache and many other things. Humaira Majeed, 30, hails from a well-off Buchhpora family in Srinagar where she lived for 24 years of her life. She has done her schooling from Presentation Convent School, Rajbagh and later graduated in the field of commerce from Nawakadal College in Srinagar. Since her childhood, Humaira was always ambitious and loved travelling. Her engineer father has always supported her in taking her own decisions. Her family gave her the confidence to work hard and achieve things in life and she feels lucky to have them. In 2013, she left for Delhi to work for American Express. After two years, she shifted to Equity Abroad for a few more years and still works there as a freelancer. It was during her days in Delhi when she realized that whatever she is doing is not feeding her soul. She had the zeal of doing something of her own. With numerous ideas revolving in her head, Humaira wanted to do something innovative and something that represents Kashmir. Humaira said she is a person who draws inspiration from little things around her. She used to get fascinated with all kinds of art forms, crafts, and cultural artefacts of different places including her homeland, Kashmir. Inspired by the concept of mixing art into places of food, she decided to set up an art café that will reflect the culture of Kashmir. In December 2017, she launched Café Hamee Ast’o at Saket in Delhi with the vision of promoting Kashmiri food and other Kashmir specific things that she wanted to share with the world outside. It was definitely not a cakewalk for her. Being a Kashmiri girl, it was hard for her to take a step forward to accomplish this goal and break stereotypes. “I had to face many challenges and criticism from the society but I am lucky that I had the constant support of my family and friends who would always encourage me to move forward,” Humaira said. Even while checking the properties to establish her café in Delhi, she had to go through many rejections for being Kashmiri. Humaira knew that people in outside Kashmir have a negative perception of the valley. She worked very hard to convince the space-owners to rent her space. Finally, she hired a piece of land and successfully constructed a café according to the concept and theme she had designed. On entering the café, one gets the vibe of a little Kashmir with various Kashmiri things around: Kangris, carved copperware, Tramis, Tashi-naer, Samovars, Papier-mache items, Tumbaknaris. Moreover, the café has incorporated typical Kashmiri dishes and beverages along with the continental food in the menu. For the first few months, she used to cook Kashmiri food herself until she got a chef and gradually developed the café. Initially, it was challenging to manage the café with little staff and less know-how about the business. She is happy that it has taken off.